Have you ever wondered how fast your website loads? I mean maybe that’s not a normal question. And it’s actually not something that I talk a lot about on my platform. But for today, I figured why the heck not?! Because your site speed actually has a big impact on the success of your blog. And site speed is one of the TOP ranking factors that Google looks at when it comes to your SEO (search engine optimization). So yeah… I’d say talking about how to improve your website’s speed is pretty important. But let me take it back to the beginning. You see, I’ve known for a long time that my site speed was especially slow. Like sooooooo slow. I noticed it even when I used it. So I knew that my readers had to hate it. Tell me, did you notice how slow my website was? So I decided to run a test to see what my site speed was. And you wanna guess what it came back as? 8 SECONDS. Yeah. 8. That meant that my site took 8 seconds to load when a new visitor landed on my website. Now I’m not going to get crazy into detail here. But your site actually loads at different speeds depending on if the visitor is new or returning. Because any returning visitor actually already has all of your website data stored on their browser. So it’s much faster to retrieve. But anyway… for new visitors, my site was taking about 8 seconds to load. 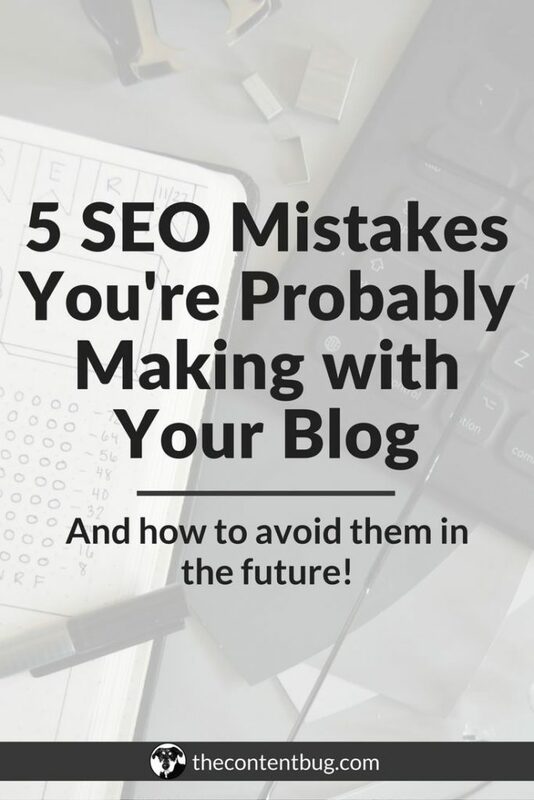 And this is bad news bears if you want to grow your website traffic! 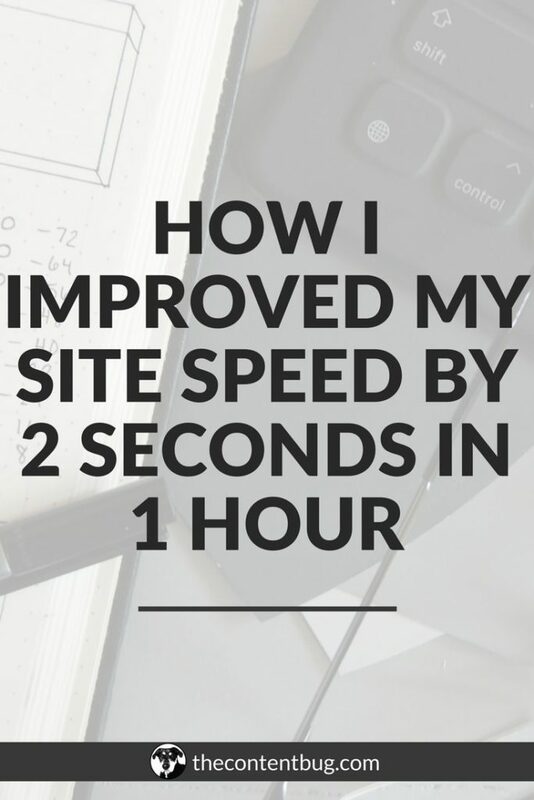 Keep reading to find out how that slow site speed was affecting my traffic and how I improved my speed by just 2 seconds in 1 hours. I already told you that your site speed affects your SEO. That means a slower site is less likely to appear in search over a faster site. But it actually goes beyond that! Facebook too takes into consideration how often you will appear on the News Feed based on the speed of the website link you include in the post. Well, they want to make sure that when a user leaves their site, that they continue to have a good experience. That way they come back to Facebook for more. And that’s the same motto for Google. Now, what if I told you that it’s more severe than that?! Oh my goodness… NOOOO! Think about it, when was the last time you waited 10 seconds for a site to load? Probably never. Why? Because we want everything at the click of a button. We don’t have the time to wait. So we don’t! If a site takes too long to load, most users will bounce back and pick another website to click on. That’s what they call your bounce rate, my friends. It’s said that you only have about 2 seconds for your site to load before someone will abandon your site. That means that you have 2 seconds to deliver what they are looking for. So your website better be snappy. If you do your research, you’ll actually find that Google is trying to take it up a notch. And they want all website to load in .5 seconds. That’s so crazy! Especially to think that my website speed was clocking in at 8 seconds. But Google wants to make sure that they are delivering results to their users as fast as possible. And that means that people need to have speedy fast sites to abide by Google’s standards. Now it’s not surprising that my ever so slow site was actually impacting my website traffic. 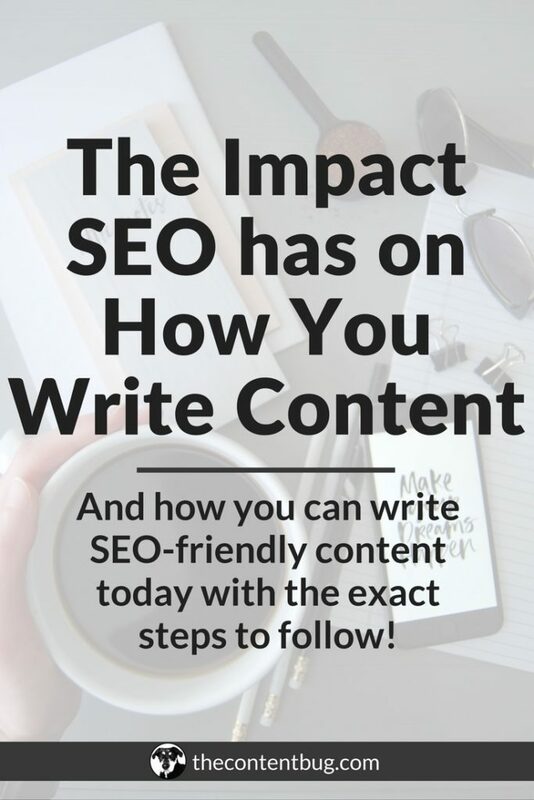 It hurt my traffic because my website’s SEO wasn’t as great. So I wasn’t being recommended as much in search as I could have been. But beyond that… my site’s bounce rate was extremely high. Now I’ve got to say: I don’t think you should worry that much about your bounce rate. Your bounce rate is a stat given to you with Google Analytics that tells you what percentage of your website’s visitors only view one page before leaving. And if you are anything like me, when I’m on a mission and want to find information on just one topic, I will read one blog post and then leave. I’ll jump to another site, read a blog post and then leave. And I’ll keep doing that until I have all the information that I need on a said topic. This is how a lot of people do it when they are on a mission. So don’t think that your bounce rate is just because of your site speed. It could be determined based on what the reader is looking for. HOWEVER! My bounce rate was around 90% when my site speed was 8 seconds. 90% is beyond abnormal for a bounce rate. I mean 90% of my visitors were only viewing 1 page and then leaving. Clearly, my site speed had some impact. And so did my lead capture system! Now as a blogger who talks all about how to improve your SEO and blog, I knew that I had to step up my game. How could I tell other people how to do things if I didn’t take the step to do it myself?! So like I love to do, I made myself the guinea pig! And within a matter of an hour, I was able to improve my site speed by 2 seconds. Now here’s the thing. That 8 seconds site speed statistic that I’ve been throwing around has only come from 1 source. The main source that I trust when it comes to website performance. Or anything SEO related. I like to use Test My Site with Google. 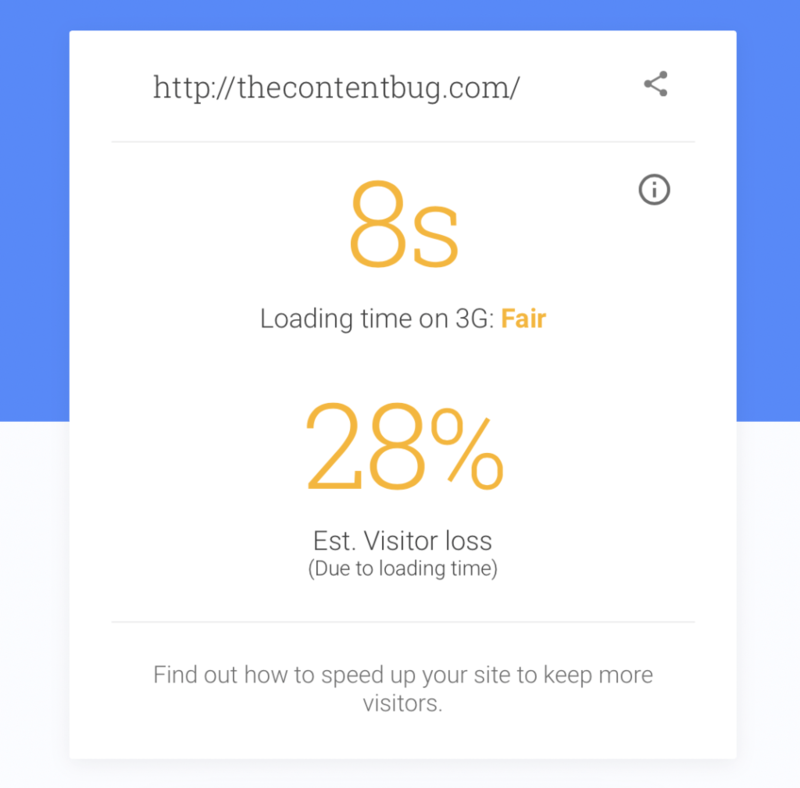 I’ve actually recommended this tool a lot throughout my blog to help test your site speed, mobile friendliness, and just overall performance. This site is completely free. All you have to do is enter your website domain and it will do all the work for you. Now why I love this tool so much is that it not only tells you how fast your website loads, but it always tells you how to improve it among other things! 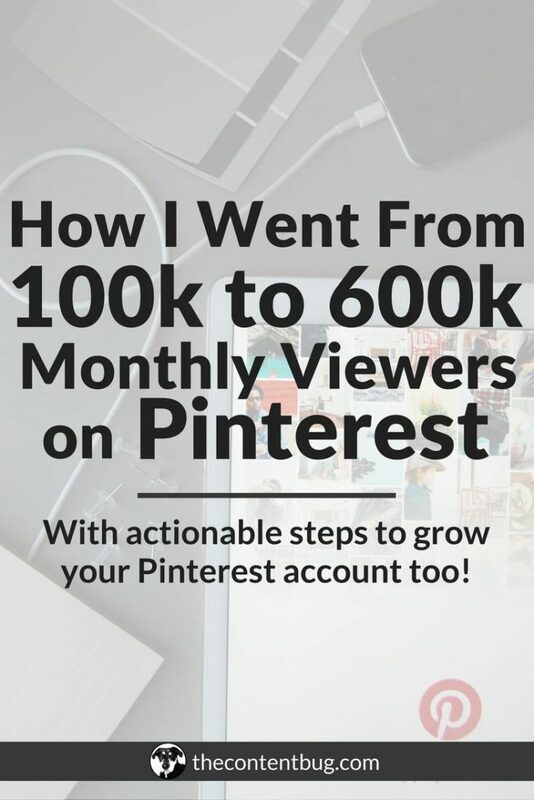 So if you have no idea where to get started, they’ve got you covered. When I ran this test a few months ago, this is the test that told me TheContentBug.com was taking 8 seconds to load. And I believed it! So I didn’t try any other testers. But after I did the work to improve my site speed, I decided to not only test it with Test My Site again, but I also tested it on 2 other platforms. Test My Site now says that my website takes 6 seconds to load. Still pretty bad right? Well, then I went to another platform, seositecheckup.com, to test my site. And it said that it was taking 2.6 seconds to load. Weird, right?! So I found yet another tester and that one told me that my site took 2.2 seconds to load. So here’s the thing. 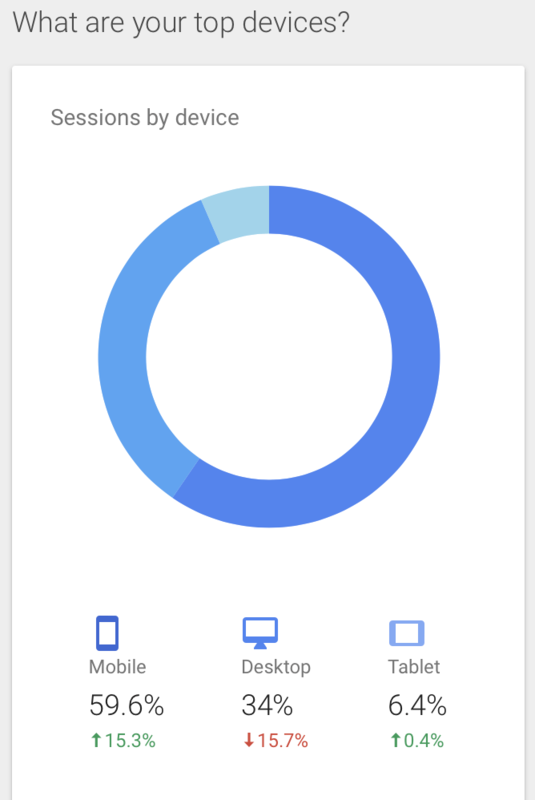 After some research, I noticed that the Test My Site tool tells you the load time of your site on a mobile device that’s using 3G! So it’s clearly not that important, right? Well, that’s not completely wrong, but it’s also not completely right. I’m happy that my site appears to be loading around 2 seconds. But I still worry that the other test says it’s taking 6 seconds. Why? Well, most of my site traffic is on mobile devices. And I have no idea if my visitors are on LTE, 4G, or 3G. So I want my site to load in a reasonable amount of time for any mobile user! But for now, I’m just happy that I was able to reduce my speed by 2 seconds. And in time, I’m going to try to improve my site speed even more! And if I do, I’ll be sure to write a blog post about it for you guys. 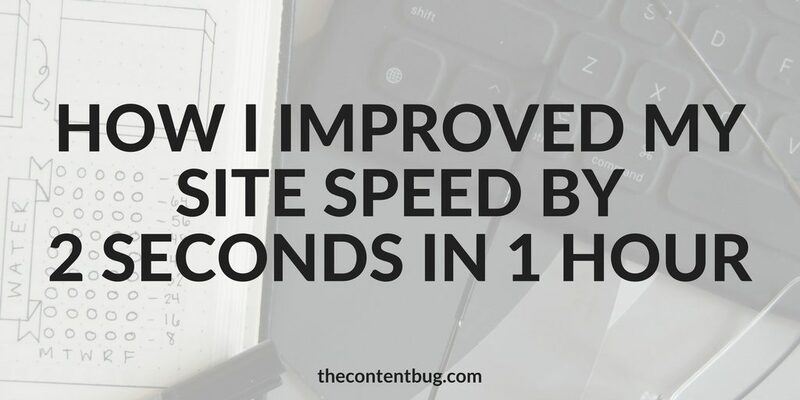 So let’s stop the intro here and get into the details about how I was able to improve my site speed by 2 seconds in just 1 hour! Before I talk about all the things I did in an hour, I do want to put a little disclaimer out there! Your site speed has a lot to do with your hosting server. And if you are currently using a small hosting server that can’t support the amount of website traffic your site is receiving, then it might be time to upgrade. When I first noticed that my site was extremely slow, I decided to make the switch to a larger hosting server. And after that didn’t solve all my problems, then I made these changes! So if you notice that even after making these changes that your site speed didn’t improve, then it might be because of your hosting server. But let’s talk about what I did in an hour to really make a big difference with my site speed! This is where I get embarrassed. I actually recommended this plugin in my Plugins You Need on Your WordPress Website blog post, yet I didn’t actually have it set up on my own. I had it installed! Heck, I even had it activated. But I didn’t take the time to set up the features that needed to be set up. So it really wasn’t doing anything but sitting there. So I took the time to watch a 15 minute YouTube video about the proper settings you need to select to improve your site speed with this plugin. Honestly, I’m not an expert on this, so I’m not going to try and tell you guys exactly what I did to set up this plugin. What I will tell you is that you need it! And if you want more information, go to YouTube and watch some videos. I’m sure whoever you find is more of an expert than I am. Ahhh image optimization. This is something I preach a lot! When you have a blog, you probably have high-quality images that you include on your website. If not, what the heck are ya doin?! With any high-quality photo comes a large file size. And if you just upload that image right to your website without compressing it first, you’ll actually hurt your site speed dramatically! Because large images take a long time to load. So a lot of large images = a slow website speed. Now I run all of my images through JPEGmini.com before I upload them. But Test My Site with Google was still saying that I needed to optimize my images. So I found this plugin to do all the work for me! With this plugin, you can actually optimize all of your images right on your blog! So all the images that are already uploaded, whether they are compressed or not, you can send through this plugin to be optimized. And then every time after that, when you upload an image, it will automatically compress it! So I still run my images through JPEGmini.com and then let the EWWW Image Optimizer do the rest of the work for me. When I first launched my blog, I only had 1 small piece of CSS. And that was to remove the theme designer’s name from my footer. I just didn’t want it there! So I added special coding to remove it. Well when I redesigned my blog a few months later, I went crazy with the CSS! I thought it was a fun way to transform the theme into something that was my own. And make it really stand out and look different! So I learned a lot about CSS. Came up with my own codes. Evaluated placed on my website that I wanted to make minor tweaks and made all of those tweaks with CSS. What I didn’t know back then was the additional CSS, especially CSS that goes against what is written into the code of the theme, can severally slow down your website! Now if you have no idea what CSS is… With WordPress, you can use the customize page to add custom CSS to change different aspects of your website’s appearance. It basically allows you to write over the code so you don’t have to go into the back end of your site and change it that way. It’s really just website customization for the none website designer. And it’s dangerous because it’s addicting! Anyway, I ended up with a lot of CSS on my site. So I decide to use a CSS optimizer to compress my CSS. That basically means removing all the unneeded white space so that it can be processed easier. I knew that this was going to make a difference in how my site loaded, but deep down, I knew that I had to do more than that. I had to remove a majority of my CSS that made minor impacts to the look and feel of my site. So I went through the code one snippet at a time and determined what I could get rid of and what I couldn’t. I specifically paid attention to the top fold of my site. Any CSS that affected the top fold of my site had to be strategically thought out. Because this is the first portion of your site to load! And you need it to be fast! I’m actually going to talk about this in the next section. So let me wrap up the CSS portion with this: I honestly believe that this was the big game changer when it came to improving my site speed. There was a lot of unnecessary CSS that I included just because I could. But by removing it, I allowed my site to load with more ease. Like I just said, you need the top fold of your website to be able to load easily! So that meant removing my CSS that moved my main image text to the left. And now that it was back to center, I needed to find a new main image for the home page of my site! But there was another reason too. That main image was way too large! And loading that image took a while! So despite compressing the image and using the EWWW plugin, the image was still too large. So I changed my hero image to one that had a smaller file size. PS: For those of you who are wondering, a hero image is a large image that is used on most home pages. That’s called the hero image. I’m going to guess that your site doesn’t have all the same problems that mine did. Each site is different! So what I would recommend to you is running your website through Test My Site with Google. They will be able to tell you how long your website takes to load and it will give you suggestions on what to improve! Both of which I’ve looked into and both are something that I’m considering for the future. But for now, I’ve got other more important projects to work on! I hope you found this helpful and that you learned from my CSS experience never to overload your CSS! I’ll see ya back here soon with another post! 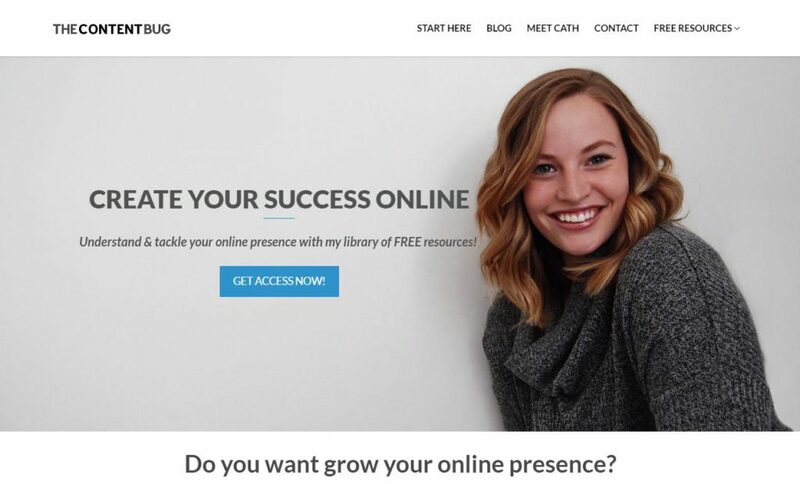 Cath, I read lots of blogs and articles about website optimization, blogging, pinning, etc. This is by far the best one I have seen. No joke, your information and resources are organized so clearly, and your recommendations are so actionable. Really practical, straightforward, important tips. I am implementing some of the changes now on site speed, and I cannot wait to see how it all works. Thank you so much for all the high quality information. Bravo on a great site! Thank you so much for that kind comment! I really appreciate it. 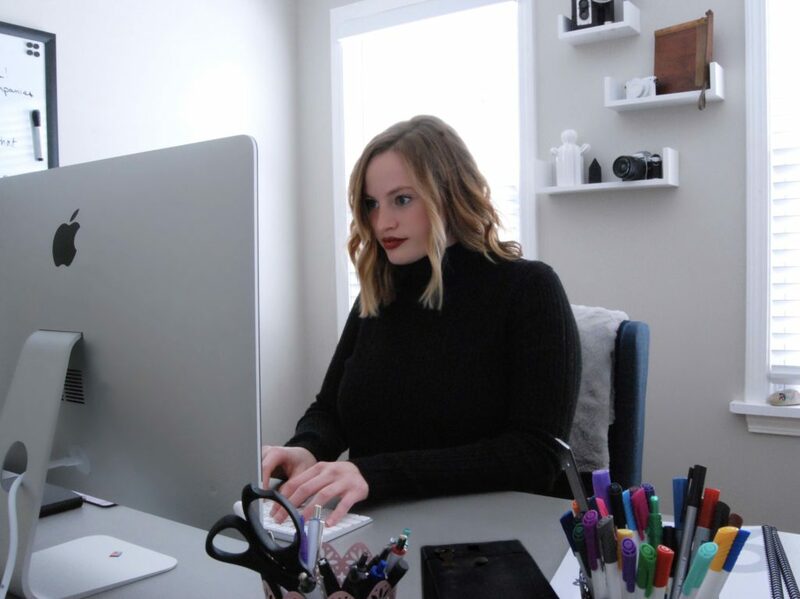 I work hard to make sure that I provide the best content possible with every blog post and resource. If you see results, make sure you come back and share! Thanks for writing about your experience with this. I typically use a caching plugin with my sites, but not usually W3 Total Cache (although it is a popular plugin). A lot of my sites are hosted with SiteGround and they have their own hosting plugin. For one of my sites on another host I use WP Rocket. Adding a CDN to serve the images can also help. As you mentioned, image file size has a big impact on load times. In some themes or caching plugins you can enable lazy loading so images load when they are on the screen and the page load isn’t held up by a bunch of images. This makes a huge difference on one of my sites that uses a lot of images in blog posts. That’s some great insight! Thanks for sharing!